Why isn't Kurt Vonnegut's influence seen in more video games? I couldn't help but wonder that after playing through Vonneguts & Glory, a new (very short) browser game by Shaun Inman based on Kurt Vonnegut's classic novel Slaughterhouse-Five. It's a weird little thing, a shooter that is unstuck in time—you move backwards, picking up from your death and "unshooting" enemies, bringing them back to life and healing yourself. It's got a pretty cool soundtrack, as well. The game was created as part of the 7 Day FPS Challenge, which tasks players with creating a first person shooter… in… seven days. Okay you probably guessed that. The short development time explains Vonneguts & Glory's brevity, but it's fun to imagine where a developer could take this idea if given more time. 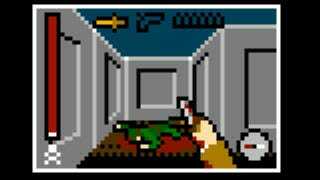 Something like Braid combined with Wolfenstein 3-D, I suppose? I bet Soulja Boy would love this game.